In his first ever media conference since he become the 16th president of the Philippines, President Rodrigo Duterte promised to implement the so-called 'Freedom of Information' in the executive branch next week. According to report by GMA News, since assuming presidency on June 30, He welcome his first press briefing through the state-run PTV-4. Duterte said, "Due to the constant and insistent demand... I have decided to hurry up the process," in his interview with state-run PTV-4 in Malacañang. "So, this will be implemented at the very least next week. This was just submitted to me at the Cabinet meeting and I have to review it personally," Duterte added. But president Duterte pointed out that he could only attain this action in his own department and not to the other sector of the government like in judiciary and congress. He said, "Now first I would like to remind everybody i can only bind the executive department, my branch of government. I cannot mind the other two, the judiciary and Congress because of the separation of power." "But it is up to Congress if they want they can file and maybe come up with a copy of the Freedom of Information Law," he added. 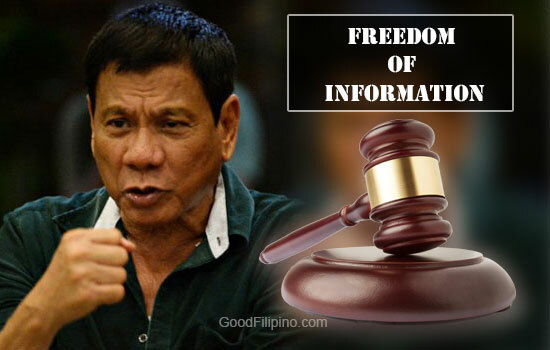 Do you agree with President Rodrigo Duterte's decision to implement FOI? Please share your thoughts below. Comments or suggestions about "Duterte promised to implement FOI in executive branch next week" is important to us, you may share it by using the comment box below.